Fish scale tile is definitely causing a scene in the design world. The ocean-inspired tiles can add a calming element to any bathroom. While we may attribute fish scales with cool greens and blues, fish scale tiles are available in endless colors and sizes. 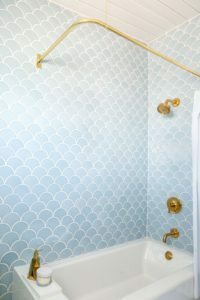 If you want to shy away from too much color, fish scale tiles can be paired easily with more traditional and simple designs by choosing neutral tile and grout colors. While wood look tile may not be a “new” trend, we believe that it is a trend that will continue to climb in popularity in 2017 and beyond. 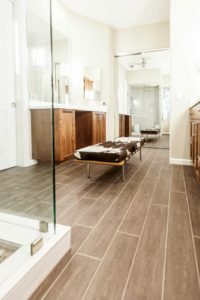 This flooring option is not only popular in bathrooms, it is also becoming more common in kitchens, living areas, bedrooms, and more. They are the perfect option for those who love the look of hardwood floors, but hate the upkeep. We recommend installing wood-look tiles in interesting patterns, such as herringbone or chevron, to create interest. Geometric tiles can range from angular patterns with sharp lines, to more curved and floral-like patterns. 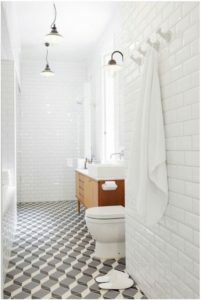 When paired with simple and classic tiles, graphic tiles add a level of excitement to any space. The variety of shapes, colors, and patterns makes this trend suitable for any design style. One of the biggest trends in geometric design right now are hexagonal tiles; however, other shapes such as triangles, stars, and circles are also chic tile choices. They are a bold choice, yet can be incorporated beautifully in small spurts to avoid overwhelming the space. Penny tile has been on the rise (again) in recent years. They originally debuted in the early 1900’s due to its durability and ease to clean. Penny tiles are typically offered in small circles, also called penny rounds, as well as square and hex shapes. 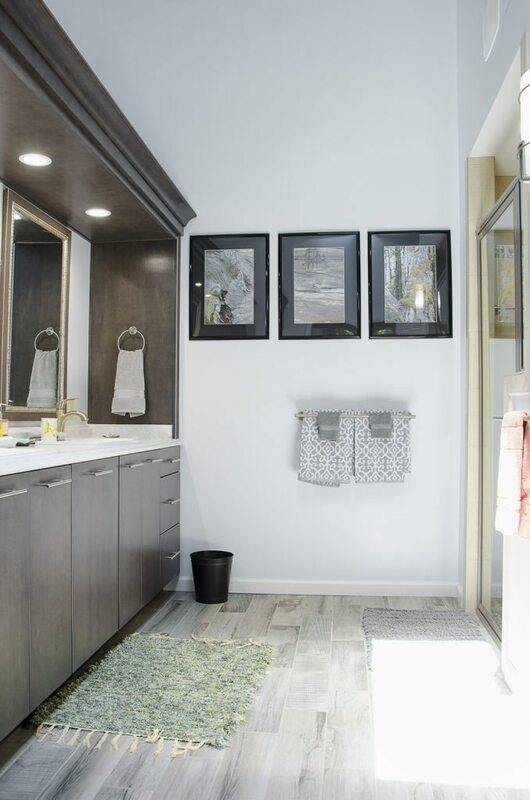 Since they are small, penny tiles can help to make a small bathroom appear larger. 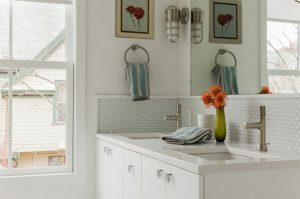 As a bonus, penny tiles are a great bathroom tile option since they are relatively easy to install. While they are typically installed in black and white patterns, brighter colors are becoming more popular.